Boilermakers employed by Day & Zimmermann are demonstrating their skills at Westar Energy’s Jeffrey Energy Center in St. Marys, Kansas, where crews are working the Spring 2017 outage on Unit 1. The job follows on the heels of the Unit 2 fall outage, successfully completed late last year. Jeffrey Energy Center is the largest fossil power generation plant in Kansas, with three units rated at a combined 2,155 MW. The Unit 1 outage mirrors work performed on Unit 2, including the replacement of re-heat outlet headers and air heater baskets as well as ancillary repairs to the boiler and other components. Boilermakers worked more than 100,000 man-hours on Unit 2 and are expected to work a similar number on Unit 1. Replacing the old header sections, each weighing some 36,000 pounds, required use of a 500-ton hydraulic crane positioned below the penthouse of each unit. Following the 200-foot lifts, Boilermaker crews moved the new headers into place using a series of trolleys and air hoists. 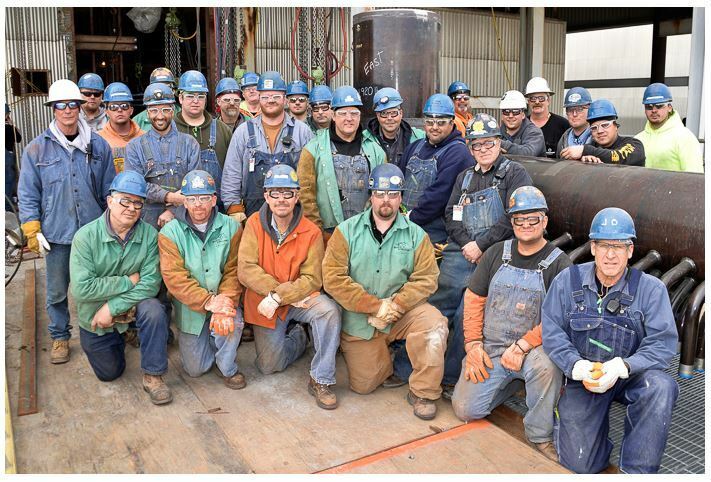 On Unit 2, over 1,700 terminal tube welds were made, along with 28 6-inch riser tube welds, two 26-inch welds, and two 30-inch link connection welds. Crews achieved a weld rejection rate of just 1.6 percent, and the header project remained on schedule or slightly ahead of schedule from start to finish. Welding on the new Unit 1 headers began in late March 2017. On the Unit 2 Fall 2016 outage, Boilermaker crews pulled and replaced more than 1,000 air heater baskets while also making repairs to the air heater system. The same work is currently under way on Unit 1. This article appeared on www.boilermakers.org and was written by Mark Shoemaker, Bull Steward, Local 83.